The human communication text that uses real stories, the liveliest examples, and the most current scholarship available. 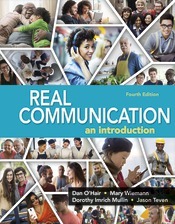 Real Communication uses the liveliest stories from real people and the world around us as the foundation for teaching the theory and skills of human communication available today. Professors and students alike have fallen in love with the authors’down-to-earth writing style and commitment to providing the most current scholarship that reflects the world we live in, from the challenges that arise with pervasive digital media to new ways for understanding listening goals. They also appreciate how Real Communication weaves together the discipline's different strands with "Connect," a feature that shows students how to apply concepts across interpersonal, small group, and public speaking contexts.